The wait time can be lengthy, but, that's only because the DR is extremely thorough. He truly takes his time andaddresses any and all issues you may have. Outstanding patient care!! The wait time can be lengthy, but, that's only because the DR is extremely thorough. He truly takes his time and addresses any and all issues you may have. Outstanding patientcare!! Dr. O. Michael Obiekwe, the President and Medical Director for Atlanta Ropheka Medical Center completed his medical training and residency at Department of Family and Preventive medicine, Emory University School of Medicine, Atlanta GA. He is a Diplomate of American Board of Family Practice, Board Certified Fellow of the West African College of Surgeon, Fellow of the International College of Surgeon, and Board Certified Fellow of the Medical College of Surgeons of Nigeria. 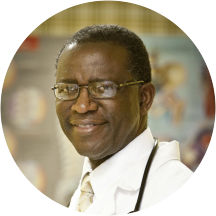 Dr Obiekwe has been practicing medicine for over fifteen years. He has earned many honors and awards including Physicians Recognition Award by the American Medical Association. He is a fellow of the American Academy of Family Physicians, Americam Medical Association and Georgia Academy of Family Physicians. He was good & very professional! It was great. Everyone was very friendly and professional. This had become my permanent Dr. Very caring nurses and doctor. They went above and beyond. My visits are always GREAT and worth the wait! My visited was horrible my sons appointment was at 10:30 he didn't see the doctor until 1:30pm we set there all that time. I will be changing my son to another physician next year. I don't think any one who paysa high premium as we all do should have to wait that long. Plus the doctor didn't even examine my son. My visit with the doctor was great! It was just the wait time, I arrived 30 minutes early still had to do paperwork even though I checked in with the app. My appointment was for 10:30a, I was seen at 11:40a, left out at 12:20. Great doctor once you are able to actually meet with him. The wait time is APPALLINGLY LONG!! I arrived @12:55 for a 2pm appointment and didn't get back until after 3 pm. Once in the exam room, I waited an add45 minutes to an hour. After speaking with several other patients in the waiting room, I was informed that this is the norm, and that whenever visiting this practitioner, you should be prepared to wait several hours. It was wasn't the worst but a few improvements in timeliness will definitely make it better. Dr. Onwura is an amazing doctor. He takes the time to know his patient and understand their needs. I will highly recommend him. He listen to my problems. Very patient and offer extra help to lose weight to help my pressure. I have to give them kudos for their bedside manners, but when it come to sending my prescription in with the pharmacy, it took them forever. Even after calling the clinic a couple of times, all I got was cold shouldersuntil I asked to speak with the Doctor on duty who finally said the prescription has been sent to Walgreen. I do hope this trend don't continue or i will be forced to look for a clinic that keep to their words. Great person. VERY PERSONAL HE WILL BE MY DOCTOR FROM NOW UNTIL I PAST. . The physician was wonderfuk and allowed me to give input in my treatment. As a young African American female with family history of HTN I know that managing my pre-hypertension is important. However I was taken back when the aid ornurse whom ever she was asked me if I was a hypercondriac.. I was floored at her questioning however its remarks/comments like these that make people less willingly to see about their health problems. As a healthcare professional for 12 years and a nursing student this is not right. Be mindful of the things said to your clients. If i didnt have confidence in the Physician I would have not made a follow-up appointment. Dr. Obiekwe has great bedside manner. I felt very comfortable with him and that he cared about my well-being. He is an excellent physician, and I would recommend him to anyone. My visit was horrible! I drove nearly 45 minutes for my appointment only to be told that I would have to wait 3+ hours to be seen. The office was completely full and people were waiting outside. One might think thatalot of patients at a clinic is a good thing, but not when their appointments are not being honored. If I had 3 hours to spend waiting around I wouldn't have made an appointmenT- much less taken the time and gas to commute in order to do so. Never again.....NEVER AGAIN. Dr. Obiekwe is a very experienced and knowledgeable doctor. I ordered an annual physical but was never given the results! The front office continually placed me on hold and never called back after 7 different attempts to reach out. I will never see this doctor again. I was in the waiting room for two hours and another 40 min in the room. I think the doctor is overbooking patients. The staff ask a lot about my personal life not pertaining to why I'm at the doctors. Ithink it could be a great place but the wait time is ridiculous. The long wait was the worst, but he seemed very forgetful. He forgot several times to call in a prescription. I got the referrals I needed and meds I needed! He listened and took great notes. I just waited a long time....almost like waiting for a celebrity! The worst experience ever at a doctors office. The wait was ridiculous arrived at 12:40 for a 1:00p appointment wasn't seen until 4p!!!!!! The staff and doctor obviously don't value their patients. Would never go back!!!! Itr was very enjoyable. I use to see other doctors that an appt. would be a all day. I was a new patient, filled out some paper work and then took back there to be seen. I was there maybe aboutone hour or so and was out to go home. I will continue to go to this doctor because he is through and don't take all day to see you.I am very, very pleased. I was worked in and they did an excellent job. Thanks. I found that he and his entire staff were kind, considerate, compassionate, and very professional. I will tell my friends and family about this physician. I appreciated the professional, yet cordial, atmosphere of Dr. Obiekwe and staff. Unlike some other waiting room experiences, there wasn't a long wait to receive service. When you left, you were thoroughly informed about your condition and the direction you should take. My visit with Dr. Obiekwe was very professional. My wife & I was very pleased with the staff and the service provided. It was nice the doctor seemed genuinely concerned. I am a regular patience now. I was impressed with Dr. Obiekwe's warmth and caring demeanor. I have already made a follow-up appointment with him. I would readily recommend him to friends and family.